Muscle cramps can spoil a workout whether it's your calves cramping during the run at the end of a triathlon or your feet cramping in Pilates class. 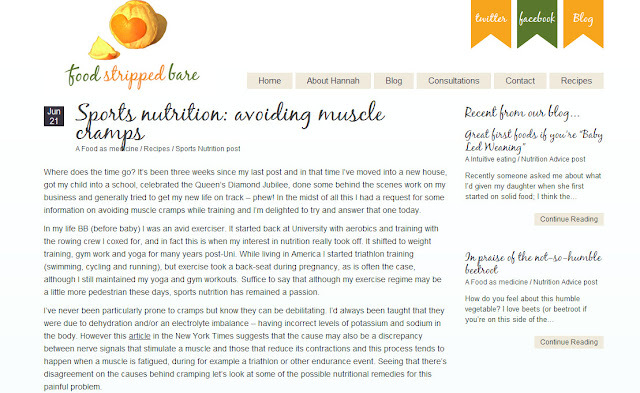 I asked Hannah Rowan to share her advice on avoiding them on Food Stripped Bare. Hannah is a UK based nutritional consultant with a passion for whole-food nutrition and evidence-based practice. She came through with this post. I tried the green minerals smoothie she recommended last weekend. I definitely favor berry based smoothies, but the green smoothie Hannah suggests is pretty tasty pre-workout and I didn't get any cramps in my calves when I swam after drinking it. Bottoms up!